Shopping and socialization merged on a warm afternoon at the Wild Ridge Plants open house. Wild Ridge, owned by Rachel Mackow and Jared Rosenbaum, is one of the few local purveyors of native plants and of instruction for those not accustomed to the needs of certain species. Narrow Mountain Road in Pohatcong Township, NJ was lined with cars, vans and trucks, depending on how extensive the customers intended their purchases to be. Wild Ridge is not primarily a retail operation. Mackow and Rosenbaum sell wholesale, often to conservation organizations. And they plan and design native plant habitats for those organizations. They both worked in conservation when they decided on creating a nursery. Their first endeavor was on rented property in Hillsborough Township in the Sourland Mountains. But they realized they needed to own their own farm because so many native species take years before they can be transplanted to a permanent home. They own five acres and are gradually putting more and more of it into native plants. Much of the farm had probably been an orchard, Mackow said. “We moved around,” Mackow said. “We decided we were done with urban living and slowly got into conservation work. I loved to be around the plants. I became hooked on long rambles.” They both had experience with long rambles. Rosenbaum grew up in Manhattan but near Riverside Park. Mackrow was raised in nearby Holland Township. Among their projects for non-profit organizations was a native green roof for the Mercer County Parks Commission. They provided native plants for a number of public gardens: Bull’s Island State Park, Duke Farms, Friends of Hopewell Valley Open Space, Pottersville Fire Company, Round Valley reservoir, Beech Mountain and the Stony Brook/Millstone Watershed Association, according to their website. Mackow added they have also worked with Hopewell School and Birdgewater Raritan High School. They also work with private clients, including people interested in butterfly and pollinator gardens. One of these is Melanie Worob. 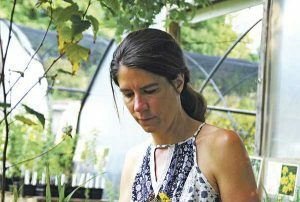 She has a sunroom garden in her Holland Township home. “Science in the sunroom,” she said of her milkweed plants and Monarch and Swallowtail caterpillars. She was shopping for more milkweed. Rosenbaum said he also leads hikes and teaches classes for people interested in native species. With the farm’s mailing list, Facebook page and flyers distributed at local businesses Wild Ridge spread the word about the open house. They have a central New Jersey/Eastern Pennsylvania client base. Customers from the stretches of Pohatcong along the Pohatcong Creek and the Delaware River were admiring asters and columbine and discussing the vegetation along the waterways which is hospitable to wildlife, including the occasional bald eagle. Wild Ridge have worked to thin out the many invasive species that spring up in fertile stretches and to bring in native plants. Wild Ridge had several tables set up with pots. The greenhouses were taped off for the open house. They are used for overwintering plants, covered with a shade cloth. A thin film is added from late November to the spring. “We prefer the rain irrigates the plants — the plants respect it better. The rain coaxes them out of their pots,” Macklow said. The film gives the plants a jump start for the spring sales which begin around Mother’s Day, she said. A number of large frames hold seeds and an open field has more plants. Rosenbaum said he has recently started an area for woodland plants. Those without a fibrous root system take longer to develop for transplanting and need to be started in the ground rather than in pots. The plants are chemical-free but not certified organic. Mackow and Rosenbaum use organic fertilizer, but their potting mix is not organic. It would be difficult to be certified organic when dealing with conservation organizations which are a large part of their clientele, Mackow said. In regard to restoration project, “a lot of the tools available to us are not necessarily organic,” she said.